Brownies are variations on a theme: how much chocolate and what kinds, how much flour, how many eggs, what size pan, what kind of sugar, and do you add brandy, rum, or other spirits…. 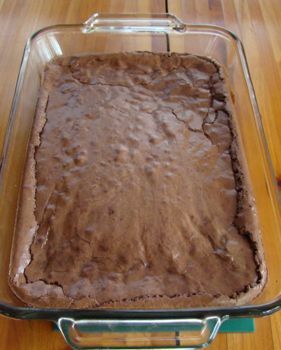 This version is a variation on the Brownies Cockaigne on pages 701–702 in the 1975 edition of Rombauer and Becker’s Joy of Cooking. It’s pretty standard, without extra flavorings. 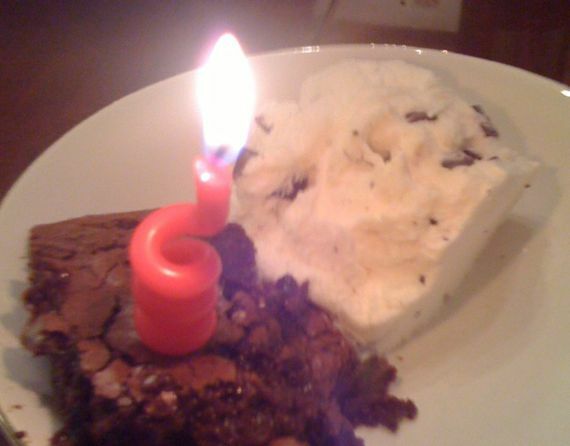 Note the “sloppy” edges on the brownie. And, happy birthday! I like chewy brownies; if you want ’em cakey, use a 9×9 inch pan. If you like nuts, add a cup of pecans or walnuts, or a blend, when the flour is partly mixed in. Keep mixing to a minimum. One of the secrets to this recipe is control of the temperature of ingredients. I really like the results I get from paying close attention to this. I think you’d get fine-tasting brownies if you just assembled the ingredients in the order listed, but the texture will be different. Crumb, I think the professionals call it…. 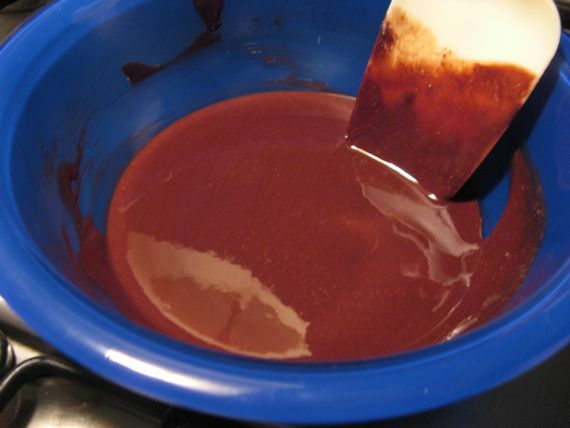 Melted chocolate and butter mixture—so smooth and shiny! Spread evenly in greased pan and immediately put pan into middle rack of oven. Bake for 22–27 minutes (usually). Wiggle pan and if the middle still shimmers, bake for 2–3 more minutes. Test again, and bake for 1–2 additional minutes if needed. Better to underbake than overbake. Here’s the hard part. Set pan aside on rack to cool. If you make these brownies, you will need to clean the cutting knife after each slicing movement, or the brownie will stick and the pieces won’t look pretty. Actually, this may happen, even if you clean the knife. If you are serving them with ice cream on top, however, do this in the kitchen and it will disguise the messiness of the pieces.